I had been anticipating this stop while I was on the cruise and now to show you what I captured during my visit. Santorini lived only in my dreams, a distant land I thought I may never reach, but so it seemed that on a wonders day, I would get to see it with my own eyes. That day could not have come any sooner, I was like a child on the way to Disney. My excitement was high, on this day I would get to check off a dream destination off my bucket list, even if it was only for a mere few hours. Santorini, could not have done anything to disappoint me, it is more beautiful then I dreamed off, more out of this world then anyone can ever imagine. I say that because, I am always reminded when I see places like these of what an impressive world we live in, nature is truly a spectacle to see. Every corner in the island is one to discover, all the nooks and crannies are so enchanting, they draw you in. I especially enjoyed the greenery, I am a lover of desert plants and terrain so this was a delight for me. I was also obsessed over all the pomegranate and olive trees, because I love both oh so much. I contemplated staying just on that alone. Santorini is home to some unique produce, which are sought after for their distinct taste. Cherry tomatoes from Santorini are favored because they are sweet and very tasty and have an intense red stain color to them. They are also famous for fava beans, white eggplant (which can be eaten raw), katsouni, a large cucumber that if left unpicked when green, it will turn yellow and acquires a sweet taste almost like that of melon. Ok, ok, and because of the gorgeously grafted leather sandals and bags, hello Greeks have been mastering leather sandals for centuries so it is no surprise I found so many stores dedicated to these beauties. Sadly I was only able to buy a small crossbody bag because le husband was in rush to see everything and gave me little time to really look for something good, but it's all good, I am happy with my little bag. I am hoping that this can be a reason to visit again. Here is one olive tree! Bae being a good husband, carrying my bag because i guess I needed my whole life in there. 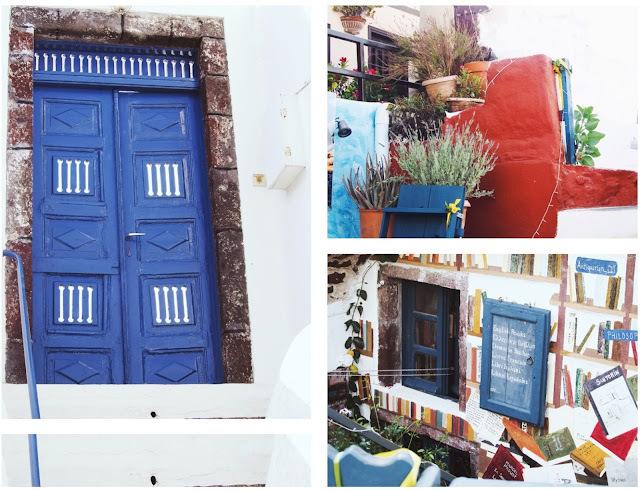 The magic and allure of Santorini, the whitewashed homes and buildings, the color was chosen in the early days primarily to help keep the homes cool from the beating summer sun. However, long ago buildings and homes had vibrant colors, which you can still see around the island, but the white still reigns king. This is due in part because residents are mandated to keep their homes, businesses and public establishments white by law, but in current years residents have been allowed to add some color. I could have stood there forever, my soul was content and grateful for this experience. Oh Santa, that gold leaf crown would look so good on my little head (wink, wink!). I also failed to mentioned that they also are masters at gold jewelry, but also masters with any other metal. I mean, after all, haven't you seen all those Greek god movies where they are draped in the most exquisite of pieces, yes I am a Greek mythology geek, therefore, anything that has Greek, I am in. Here is a pop of color of which I was telling you about earlier. I will be framing this picture most certainly, it has cacti and a kitty...I am sold. More vibrant colors to feast your eyes. Oh the blue as blue waters of this volcanic island are that of dreams and dreams only. Spectacular views are in abundance in this island, there is no shortage at all. Yup, I think this is where I was contemplating to stay or to buy real estate here. My heart would have thanked me some day. I think husband was also contemplating, what do you think? These are just a bit of the beauty that I captured on film, at the end of the week I'll bring you part II, where I'll give you a bit more on history of the island, didn't want to overwhelm you in part I. Also, shop my look below, scroll all the way to the end to see the different options I gave you.